Moderating growth, maturing markets and less intense capital commitments are some of the main drivers of Hawaiian Airlines’ positive outlook for CY2015 that includes margin expansion and cost control. After rapid long-haul international expansion that commenced in CY2010, Hawaiian during 2014 has entered into a slower growth period that should provide space for the airline to continue strengthening its balance sheet and meet its stated liquidity and leverage targets. As it takes a breather from its ambitious network transformation, Hawaiian is scrutinising the role new Airbus narrowbodies will play in its route structure once the aircraft come online beginning in CY2017. Between CY2010 and CY2014 Hawaiian will add 10 new long-haul routes to its network – Tokyo Haneda, Seoul, Osaka, Fukuoka, Sapporo, Brisbane, Auckland, Sendai, Taipei and Beijing. During 2014 it opted to cut service from Honolulu to Fukuoka and Taipei to improve the fortunes of its long-haul network, which began to turn a corner in 2H2014. Its passenger unit revenues on trans-Pacific international routes during 3Q2014 increased 11.5% year-on-year, a marked improvement from the nearly 18% drop the airline recorded the year prior. Hawaiian’s improved performance was driven by a mix of factors including route eliminations and the full maturation of other long-haul routes that have remained intact. Hawaiian’s capacity growth in CY2014 has also dropped significantly compared with the previous four years. During 2014 its supply growth is forecasted to increase 1% to 3%, and in CY2015 it is forecasted to increase 4% to 7%. 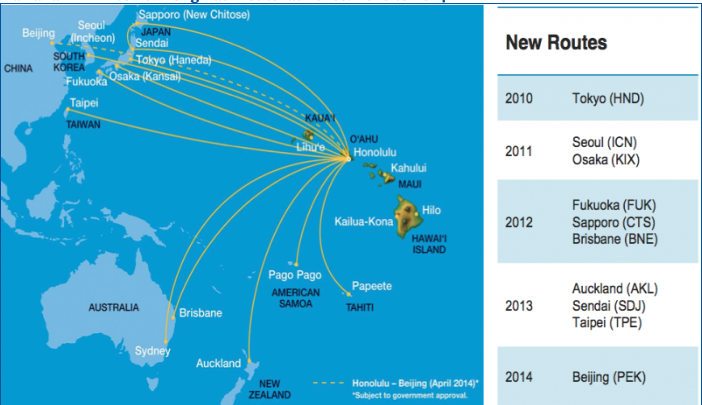 The majority of Hawaiian’s capacity expansion in CY2015 is driven by the full year effect of new route launches including Honolulu to Beijing, San Francisco to Maui and the resumption of flights from Honolulu to San Jose. At this point Hawaiian does not anticipate announcing any new routes during 1H2015, and believes slower capacity growth and a reduction in capital expenditures should boost revenue and expand margins in CY2015. Earlier in 2014 Hawaiian changed the composition of its widebody order with Airbus and also pushed back some A350 deliveries originally scheduled for 2017. As a result of swapping six A350s for A330-800neos, Hawaiian’s capital outlay should fall by USD500 million through 2018. Airline CEO Mark Dunkerley remarked that if current demand levels remain intact, fuel projections remain at current levels and no major changes occur in the competitive environment, Hawaiian is on a course for margin expansion in CY2015. For the 12M ending Sep-2014 Hawaiian’s adjusted operating margin was 8.9%, and the airline projects fuel costs per gallon including fuel hedges of USD2.30 to USD2.40 (based on the forward curve as of 1-Dec-2014). Hawaiian also believes there is ample upside to revenue generated from what it deems as value added products including checked bags, first class upgrades, extra comfort and preferred seating, onboard sales and ticket changes. Revenue per passenger generated from the sale of those items increased from USD14.82 to USD17.89 for the 12M ending Sep-2014. Sales of preferred seats and extra legroom is the fastest growing segment, jumping from USD7.5 million in CY2013 to USD15.8 million for the first 12 months of 2014. 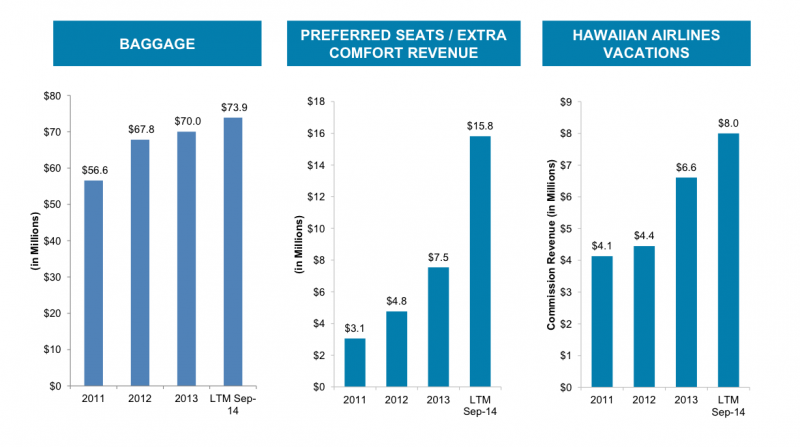 The revenue performance of preferred seating and extra legroom was driven in part by Hawaiian starting to sell preferred seats in advance instead of on the day of travel. The company’s Economy Comfort debuted in its A330 widebodies in Aug-2014, so Hawaiian expects the strong revenue momentum of preferred seating and economy comfort to continue into CY2015. Throughout much of CY2014 Hawaiian has stressed its focus on balance sheet improvement as its rapid expansion has now slowed down. The airline has opted to define both liquidity and leverage targets after it executed a new USD175 million credit facility. Hawaiian has settled on a liquidity goal of 23% to 25% of trailing 12M revenue that is comprised of a combination of cash, short term investments and the new revolving credit facility. Its liquidity targets are in the range of US airlines JetBlue and Southwest, and higher than major airlines American, United and Delta. Presently, Hawaiian’s leverage is higher than most US airlines as CFO Scott Topping explained that the airline is in a different phase in its investment cycle. Other airlines have been paying down debt and raising liquidity during the past few years while Hawaiian has been ratcheting up its growth, underpinned by capital outlay for widebodies and the expense of starting new long-haul markets. 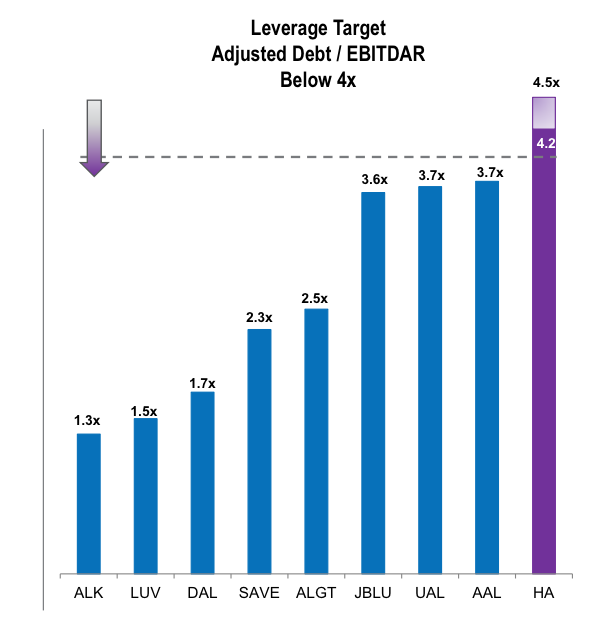 Hawaiian’s leverage goal is an adjusted net debt to EBITAR below 4x, and it projects reaching 4.2 by YE2014. 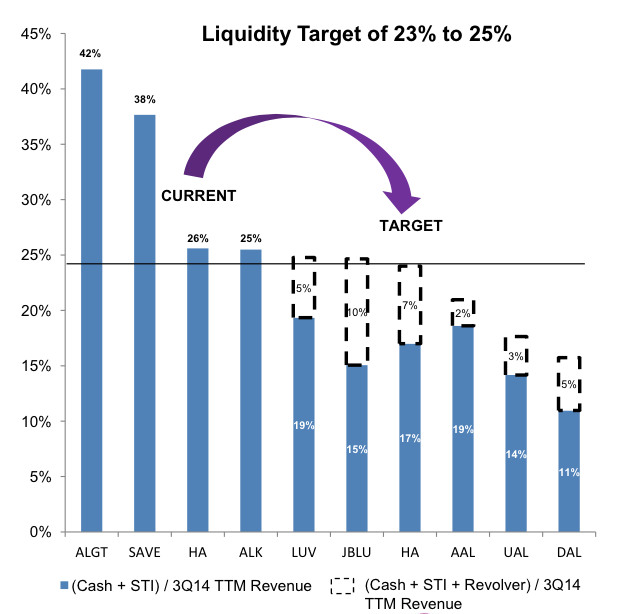 It anticipates reaching its liquidity and leverage targets during 1H2014. During 3Q2014 Hawaiian beat its unit cost estimates, recording unit cost growth excluding fuel of 0.3% compared with prior projections of rise from 1% to 3%. The airline has warned that in 4Q2014 its unit cost growth will reach 5.5% to 8.5% stemming from maintenance expense, aircraft reconfigurations to support Extra Comfort and heavy checks on its Boeing 717s. The airline expects its cost growth to moderate in CY2015 with unit costs excluding fuel growing in the low single digits, driven by pension expense, a new sales commission structure in Japan (which should also be revenue accretive) and six aircraft that were recently delivered financed by EETCs (enhanced equipment trust certificates) driving higher depreciation and amortisation expense. As Hawaiian takes a respite from new route additions, the airline is also evaluating potential new markets for 16 A321neo narrowbodies scheduled for delivery beginning in 2017. The 190-seat aircraft fill a gap in the airline’s fleet composition that currently consists of 18 118-seat and 123-seat Boeing 717s (that are being standardised with 128 seats) 264-seat Boeing 767s and 294-seat A330 narrowbodies. The 767s are being phased out during the next nine years. Hawaiian chief commercial officer Peter Ingram remarked the airline was pleased with the results of its summer service that featured non-stop service from Lihue and Kona to Los Angeles and Oakland. 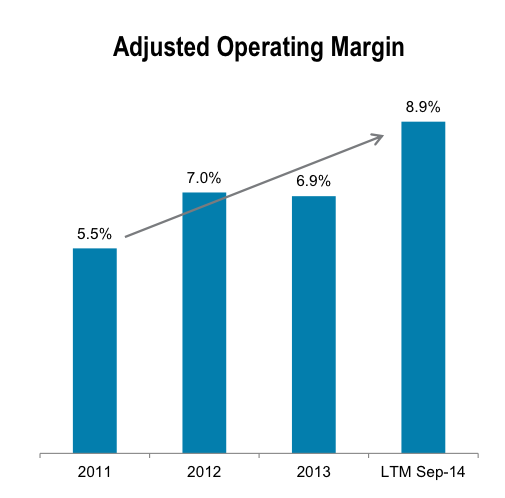 He remarked routes were unit revenue accretive during their seasonal run in 2014. The airline plans to resume those flights in the summer 2015 time period. The success Hawaiian experienced in those smaller origin and destinations markets is bolstering the airline’s confidence in the mission of the A321neo. Mr Ingram remarked that the narrowbodies make it more feasible to operate in those smaller origin and destination markets without the benefit of feed from large gateway hubs on a year round basis. Hawaiian during 2014 has redeployed some of the capacity cut from long-haul markets back into routes from Hawaii to the US west coast. As other airlines maintain their supply or add service in those markets, there is the risk that a state of oversupply could emerge similar to what occurred a couple of years ago. That resulted in Alaska Airlines and Hawaiian cutting some capacity in those markets to restore a supply-demand balance. Previously Hawaiian has estimated that industry capacity from Hawaii to North America (largely the US west coast) would grow 11% year-on-year in 4Q2014. But Mr Ingram has also assured that demand remains strong, and the capacity Hawaiian shifted back into those routes has been profitably absorbed. Absent from Hawaiian’s outlook for CY2015 are intentions for shareholder rewards as the airline studies the most prudent options for capital allocation. It still could be a little early for Hawaiian to make any definite declarations since its operations will transition to positive free cash flow in CY2015. The airline may be taking a conservative approach to capital allocation to ensure all its long-haul routes reach a favourable maturity level and the stability of its other geographies remains intact. Hawaiian also could be waiting to disclose any capital allocation strategy until its stated liquidity and leverage targets are definitively met. Hawaiian embarked on its ambitious growth plan during an uncertain macroeconomic environment; however, it has managed to execute the expansion prudently, pulling back from markets in order to maintain the integrity of its overall network. Pockets of challenges loom in certain geographies; but Hawaiian seems to be carefully solidifying a foundation to withstand the inevitable obstacles that will materialise in the future.